Trenasim A100 (trenbolone acetate) is a fast-acting injectable steroid with a great effect on protein metabolism. Trenbolone acetate is one of the best effective anabolic compounds, promoting protein synthesis, as well as creating a positive nitrogen balance. It is an appetite stimulant and improves the conversion of proteins. In laboratory tests, it has been demonstrated that trenbolone acetate increases protein and decreases fat deposition. It has proven to be an excellent product for promoting size and strength in the presence of adequate protein and calories, promotes body tissue building processes, and can reverse catabolism. Probably the most effective combination consists of 225 mg Trenbolone acetate/week, 200 mg Winstrol Depot/week, and 40-50 mg Oral-Turinabol/day and usually results in a drastic gain in high quality muscle mass together with a gigantic strength gain. Trenbolone acetate also seems to bring extraordinarily good results when used in combination with growth hormones. 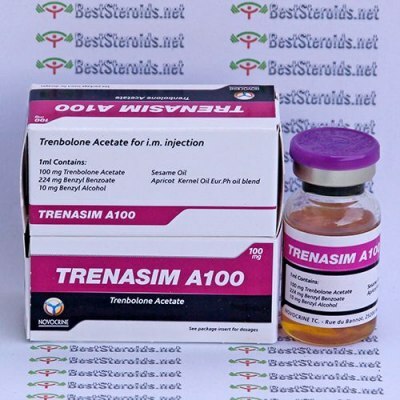 Trenbolone acetate is notably more potent than testosterone, and has an effect that is as much as three times as strong on a milligram for milligram basis. You get everything expected from Tren A, power, sweats, no sleep and clean gains... I have used it twice and the effects are crazy. No PIP to mention and it kicks in about 4 hours after. Each time I go to the gym I see more and more progress. I ran this stuff for 50 days and made more progress during that time then I did my entire natty career. Traps and delts started bulging out and taking on some serious shape. The first few weeks I was getting the tren rage feeling but I adapted to it and the sides were so minimal. I loved every moment of it. Just placed an order for 5 more after being off for 6 weeks. Strongest Tren I've taken felt it after first shot ive tried others and got bad pip but not from this one is also very well dosed. This Tren is among the supreme compounds that is available, running with test prop.. Insane lean gains. Trimmed mid section nicely.